These Fenice Hair Thinning Scissors are made of Japanese 440C stainless steel with hardness 60-62 HRC which is known as extremely durable material, therefore, these scissors are durable and long-lasting as well. As these shears are meant for hair thinning, they have two kinds of blades – one of blades has 18 micro-teeth edge, but other blade has convex edge which is known as razor-sharp edge for precise and smooth cuts. These 18 micro-teeth provide 45% thinning rate which means that 45% of hair are removed with one cut. It should be mentioned, that each of these micro-teeth is serrated, ensuring sharper cut and blurred hair cutting lines. The total length of these thinning scissors is 6 inches, but their weight is 12.3 ounces. 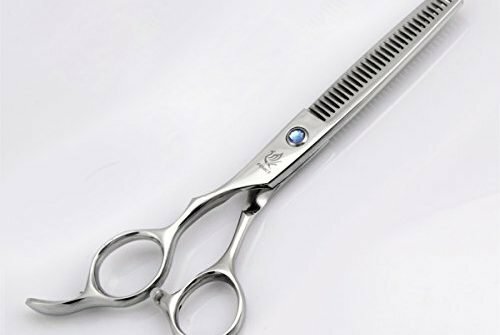 It is important, that these shears have tension adjustment screw which is hidden with decorative diamond, allowing to adjust the tension unobtrusively. These Fenice hair scissors have a finger rest which plays an important role in stress relieving from hands and shoulders to prevent discomfort and distress which can cause occupational diseases after some years of work. They do not have finger inserts for finger holes which usually help to adjust the size and thus improve the fit and comfort. These shears have cushioned stopper between finger rings which enhances comfort and improves balance and control to perform precise and smooth hair cut. It should be mentioned, that this Fenice product comes in synthetic leather storage case which provides safe and comfortable movement. These Fenice hair thinning scissors are silver color with nice sheen. They have asymmetric handle which means that their finger rings are not symmetric. Special design element of this Fenice product is tension adjustment screw which is hidden with decorative, light blue diamond, giving them an elegant and delicate look. They also have Fenice logo next to the tension screw. These Fenice Hair Thinning Scissors, as one might guess, are intended for hair thinning or texturizing. Hair thinning means reducing of hair bulk, but hair texturizing means forming of certain hair texture. This Fenice product is more suitable for professional barbers and for usage in barbershops. These Fenice Hair Thinning Scissors are meant for hair thinning or texturizing. They are made of Japanese 440C stainless steel with hardness 60-62 HRC. As these hair scissors are intended for hair thinning, they have two kinds of blades – one of blades has convex edge, but other blade has 18 serrated micro-teeth which provide 45% thinning rate. Their length is 6 inches, but their weight is 12,3 ounces. Considering that they are made of stainless steel, they are silver color with slight sheen. They also have asymmetric handle with cushioned stopper and tension screw with light blue diamond. These Fenice hair shears have non-removable finger rest, but they do not have finger inserts for finger rings. This product comes with synthetic leather storage case, so they can be moved safely and comfortably. 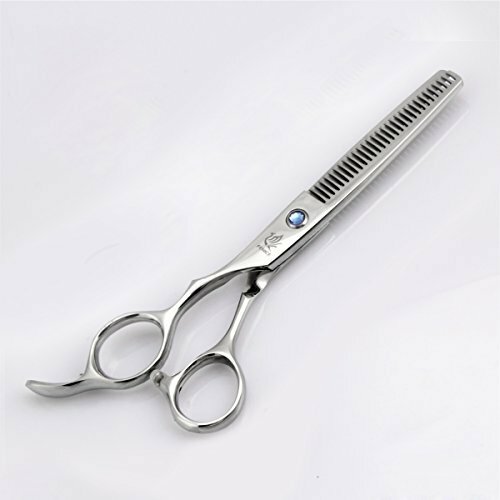 If you are professional hairdresser, these Fenice hair thinning shears are for you.